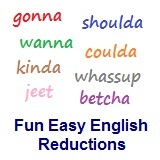 ﻿ Fun Easy English - new-american-english-reductions-reduced-words-topic-word-to-has-to-hasta. In this lesson you will learn the American English reduction hasta. She hasta work this weekend. She has to work this weekend. He hasta quit drinking so much. She hasta begin working at night. She hasta get her hair cut today. He hasta apply for college today. She hasta make breakfast now? Note: Hasta can be used with the singular pronouns he and she. Hasta cannot be used with singular or plural pronouns like I, you, we, and they. Hasta cannot be used for interrogative (question) sentences. Pronunciation of hasta closely follows has to and is not to be confused with the Spanish word hasta which means until. Reductions, such as hasta are not real words in English.